Pizza for breakfast? Pizza brunch? Hell yes! 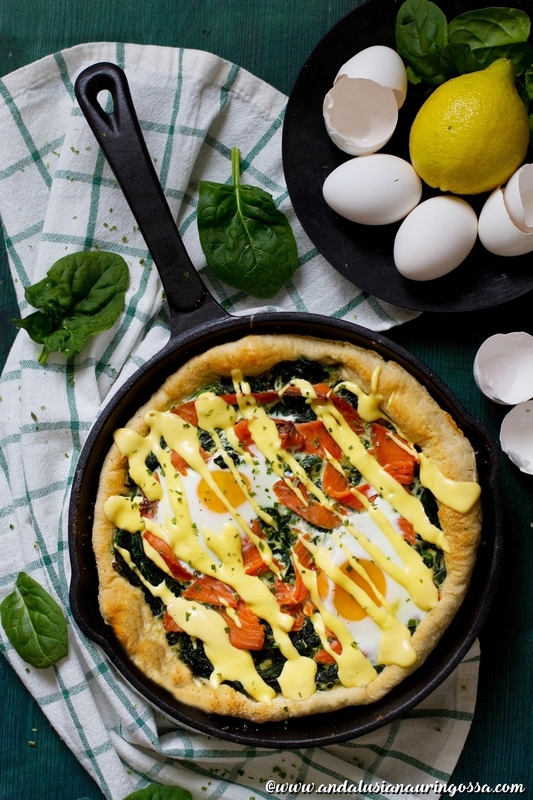 This breakfast pizza with spinach, cold smoked salmon, eggs and fool-proof Hollandaise is perfect for lazy weekend mornings! In my blog post about foodie traveller's Gothenburg I probably should have also included Brewers Beer Bar, another Tredje Långgatan gem which is pretty much as close to heaven as it gets for those (oh, so individual) lumberjack shirt-wearing, bushy beard-sporting hipsters. It's not just their selection of craft beers (anybody else getting soooooo tired of that word?) that keeps the hipsters flocking here, it's also their sourdough pizzas. Let's all take a moment to let that really sink in. During weekends they serve a brunch, which consists of exactly one dish: that sourdough pizza. As a breakfast version. Yes. Pizza. For breakfast. I'm going to start growing my beard right now. There are two choices. Either English Breakfast (yes, with all those accoutrements guaranteed to repair any damage you might have done to yourself the night before) and Florentine; pizza with spinach, ricotta, artichoke and stuff - all topped off with a dollop of Hollandaise. Sure, I've had pizza for breakfast several times in my life. And sure, mostly on Sunday mornings and those endless days following New Year and First of May celebrations. But there's something about crawling to the door to receive the delivery guy with the make-up from night before running down your cheeks that somehow makes the whole operation decidedly less... glamorous. But enough of that visual! I can't think of a better way to kick off a lazy weekend day than this. Have frinds over, put on some music, pour everybody a round of Mimosas and whack these babies onto the table. Oh, yes. I can tell you as soon as I put a photo of this on my Instagram, next Sunday was booked in seconds. They are so rich that 2 pizzas easily feed up to 8 people. Another great thing? You'll make the pizza dough in just minutes the night before. More great things? That Hollandaise really is fool-proof and is ready in matter of minutes. But, in case you don't have an immersion blender and one of those accompanying tall beakers, cheat away and use a ready-made one. Oh, and if you prefer it that way, you can add the cold smoked salmon slices into the pizza after it comes out of the oven, too. You'll find my trusty pizza dough recipe on the blog over here. Pre-heat oven to 275°. In case you own a pizza stone, put it in the oven now. If you don't, use a tray. Or a cast iron pan. Once the oven has reached the temperature, leave the pizza stone/ equivalent in the oven for another 45 minutes. Heat a little butter or oil in a pan and wilt the spinach. Add lemon zest, crème fraîche and season. Go easy on the salt, as salmon has quite a bit of it. Stir well. Roll the risen pizza dough into 2 similar-sized bases and tansfer them onto the pizza stones. 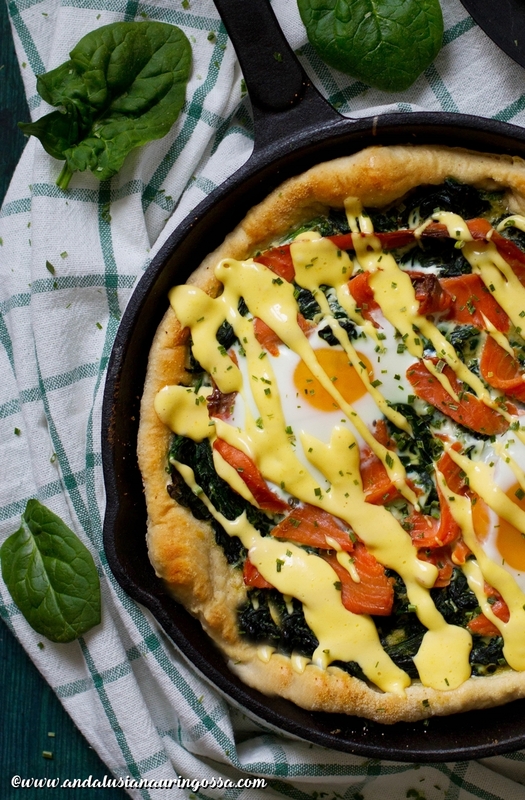 Spoon the spinach mixture on the pizza base, top with slivers of cold smoked salmon and break 2 eggs on top of each pizza. Bake for 6-10 minutes (depending on the oven) until the eggs have set and the crust has a bit of colour on them. In the meanwhile prepare the Hollandaise. Measure the ingredients (apart fro butter and chives) into the blender's beaker. Melt the butter in a small pan. Blizz the yolks with rest of the ingredients and then, with the blender continuously running, add the hot butter in a thin stream. Voilà - you've got yourself a billowy Hollandaise! In no time! Fold in chives (if using), check the taste and season as needed. Drizzle on top of the pizzas and serve. Pizza for breakfast - yay or nay? 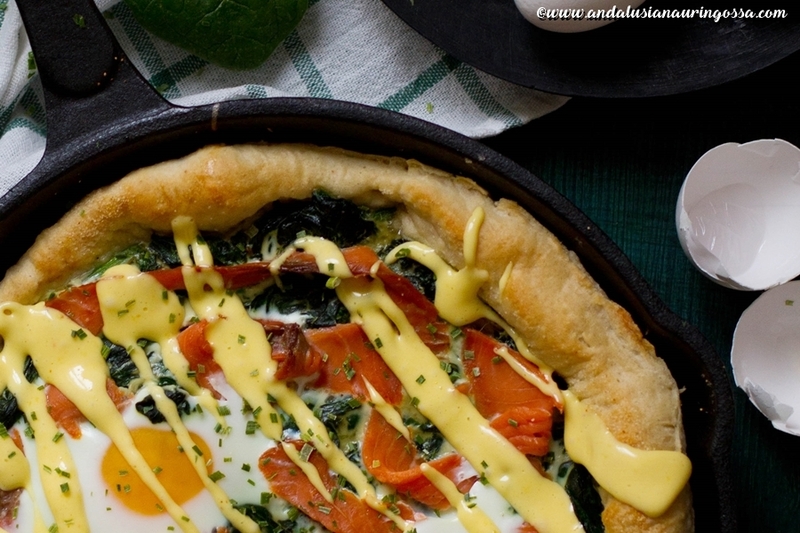 What would be your favourite toppings - smoked salmon, spinach and eggs or something else entirely?